This is easy walking through fascinating countryside full of contrasts between rolling open farmland, salt marshes, sandy beaches, cliffs, dunes and of course the Brecks (a unique landscape of forest, open heathland and agricultural land, and home to many unique or distinctive birds, plants and animals). The Peddars Way and Norfolk Coast Path in fact starts in Suffolk at Knettishall Heath Country Park, to then follow the route of the old Roman road to Holme-next-the-Sea on the north Norfolk coast. At Holme the Peddars Way merges into the Norfolk Coast Path, which runs from Hunstanton to Cromer. This is easy walking through fascinating countryside full of contrasts between rolling open farmland, salt marshes, sandy beaches, cliffs, dunes and of course the Brecks (a unique landscape of forest, open heathland and agricultural land, and home to many unique or distinctive birds, plants and animals). Peddar’s Way: £375 per person, based upon two people sharing. Norfolk Coast Path: £375 based upon two people sharing. Any day depending on accommodation availability. 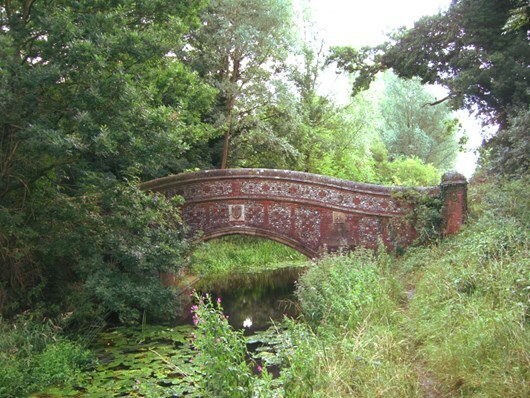 Starting in Suffolk at Knettishall Heath Country Park, the Peddar’s Way follows the route of the old Roman road to Holme-next-the-Sea on the north Norfolk coast. At Holme the Peddars Way merges into the Norfolk Coast Path. Transfer from Thetford to trailhead is included in the tour price. Start the Peddars Way here, where the last ice age over 12,000 years ago left pingo ponds and curious patterns in the heath land vegetation. 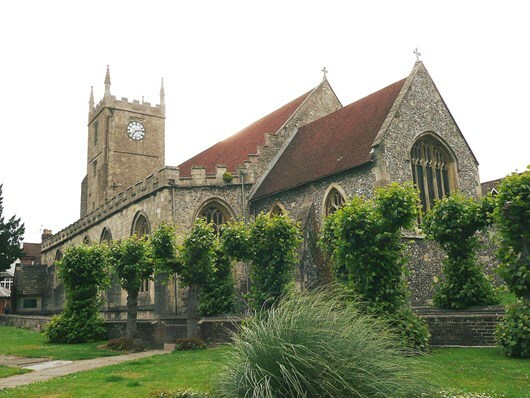 From the water and windmill of Little Cressingham to the popular village of Castle Acre, the sense of history is ever present. At Houghton-on-the-Hill is the church of St. Mary’s and its 11th Century wall paintings. This is old heathland, ploughed to wide cropped farm fields in the early 20th century, beneath the wide canopy of the sky. Walk along a former railway line, as the local building material of carrstone appears, giving a warm glow to houses. Finally, your first glimpse of the sea. Depart from Hunstanton after breakfast. This is a route of sea, sand, marsh and sky with small harbours and flint villages. 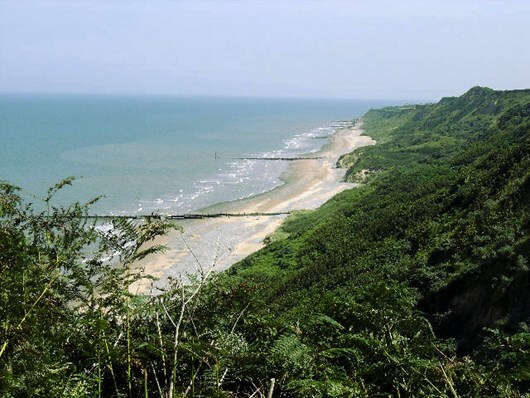 This is the Norfolk coast AONB, internationally renown for its wildlife. See winter flights of pink-footed geese, as you have never seen before, silhouetted against the evening sky. Experience the wild remoteness of a lonely sea bank. Intersperse the natural world with the warmth of village life and you have a wonderful experience. 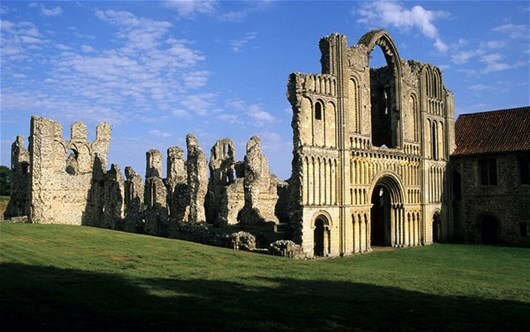 On a clear day see the Lincolnshire coast and, beyond, the Wolds area of outstanding natural beauty. The wild coastal route continues, interrupted, perhaps, by a visit to Holkham Hall, home of the 19th Century agriculture improver, Thomas Coke. Wells-next-the-Sea has a fine mix of historic buildings, and the old port. You might catch a glimpse of bait diggers on the mud flats; or you could take a trip from Morston to see the seals. Walk grassy paths overlooking one of the most important areas of salt marsh in Europe and see a wide variety of birdlife at Cley-next-the-Sea. 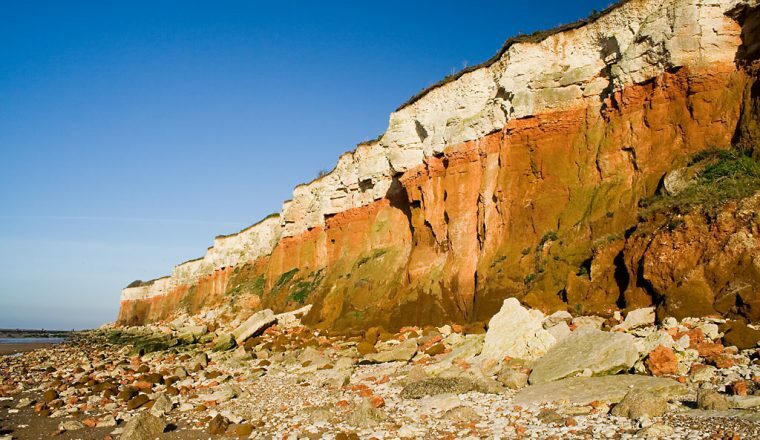 Norfolk’s cliffs are not huge but, deposited by the retreating ice of 12,000 years ago, these cliffs have yielded mammoth bones. Climb the Cromer ridge before descending through woodland to Cromer itself, with its pier, and its ales and seafood. Accommodation is on a bed and breakfast basis in a variety of accommodation – B&BS, guesthouses and Inns.